One of the wonderful aspects of traveling is the opportunity to meet lots of people. I tend to be shy around people I don’t know, but because of my travels I force myself to engage strangers in conversations. This technique has helped me move slightly away from my introvert tendencies. The joy in talking with strangers is that their stories are fascinating. Regardless of their backgrounds, social status, or jobs, strangers’ stories keep me wanting to hear and meet more people, learn of their struggles, paths, passions and resilience. This past week was no exception. 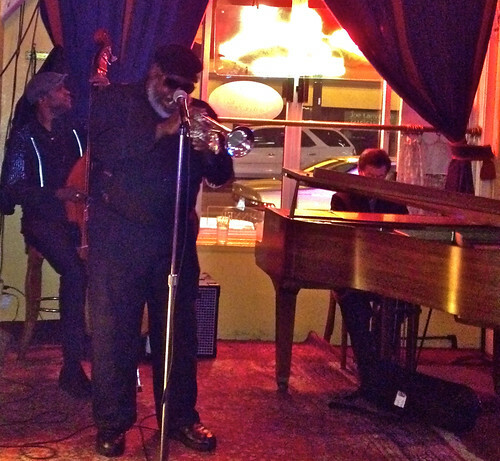 I met Steve Hub while listening to Jazz at Les Joulins in San Francisco. Steve travels extensively, thoroughly enjoys his work and believes in his company’s service. On one of his business trips, in Istanbul he got in a cab, beat tired. Traffic was at a standstill so he dozed. After waking, he noticed the driver was expertly moving in and out of thick haphazard traffic. He also noticed that the driver was using a metal rod with his right hand while he drove. The driver, who did not speak English, looking in the mirror, recognized Steve’s curiosity with a welcoming, warm smile and pointed down. Steve then saw that the driver had no legs. "Okay," I replied. "What did you change?" I was wondering if I maybe asking him something too personal. Steve also shared with me the blog post he had written for his company, Corporate Visions. The article describes how we have the tendency to focus on what our organizations do not have. Instead, we should focus on our opportunities and capabilities. Let’s stop talking about what we don’t have. Let's focus on our capabilities and our opportunities. Each one of us can focus on our own individual capabilities and opportunities. Our organizations should be capitalizing on our strengths and what sets us apart. Though Steve had written a blog post that translated the inspiration into a business statement, it was evident he was deeply affected personally. The greatest changes we can make are those that we make individually. We don’t need a supervisor, director, stakeholder, family member, or anyone else to tell us to change. We can realize needed changes on our own. And sometimes, it may take a taxi ride or a short conversation with a stranger to see the wonderful opportunities that are within our own skills, talents and resources. *One final note: as I finish editing this post, I realized that I am writing this article more for myself than for anyone who maybe reading it.